17 June 2016, Ho Chi Minh City, Vietnam – In partnership with Vietjet Air, Panasonic Vietnam launched the “Cung SKY, Don tuong lai” campaign, aimed at promoting the latest Panasonic SKY Series air conditioners. 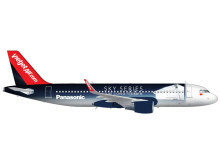 Vietjet Air’s Airbus A320 will take off with a stunning blue image of the Panasonic SKY Series air conditioner starting today, servicing thousands of routes in next two years. Panasonic is the first electronics brand in the country to engage in aerial advertising utilizing aircrafts. Panasonic SKY series air conditioner has a reversed mechanical structure compared to the conventional air conditioners, in which air is suctioned from the bottom and discharged at the top of the unit. By having this unique structure, Panasonic SKY Series air conditioners incorporate Radiant Cooling technology, inspired by the comfortable and cool atmosphere found inside caves. With Radiant Cooling technology, cool air is directed towards the ceiling which then spreads throughout the room and down the walls. Additionally, such design ensures cool air will not blow directly on customers. This way, health problems such as cough, cold and dry/dehydrated skin can be prevented. Combined with nanoe-G and dust sensor air purification system, viruses; bacteria and fine particles of up to PM2.5 are removed, thereby enhancing air quality. “SKY airplane lucky passenger prize” where one lucky passenger on this special airplane will be chosen weekly and given a SKY series air conditioner. “SKY airplane witness prize” involving an online weekly photo contest on Panasonic Vietnam’s Fanpage. Participants are required to upload a photo with the real SKY airplane. Different themes will be announced each week. 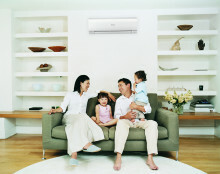 Again, one SKY series air conditioner will be given to the winner of “the photo of the week”. “SKY air conditioner quiz for everyone” where participants are requested to take part in a SKY Series quiz on the www.panasonic-sky.vn website. A winner will be chosen from participants who answered all questions correctly, and then awarded a pair of complimentary Vietjet Air ticket. Various other online and offline events will be held from time by time. The campaign will begin from 1st July and continue until 15th December this year. 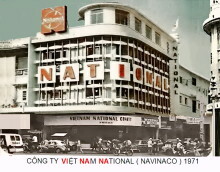 The goal of the campaign is to provide opportunities for Vietnamese customers to experience SKY and enjoy SKY. 2016 marks Panasonic’s 10 years of contributing to Vietnam’s economic progress. With Vietnam as one of the company’s strategic markets in Southeast Asia, Panasonic Vietnam will continue to expand its manufacturing facilities, as well as research and development center towards supporting the country’s sustainable development. The “Cung SKY, Don tuong lai” campaign belongs to a series of commemorative activities to mark Panasonic’s 10th anniversary here.